Solely as a script, Fan is an underwritten, messy construction of unrealistic proportions. But when viewed as a jugalbandi between Shah Rukh Khan and Shah Rukh Khan, the experience is unique and rewarding, feels Sukanya Verma. Every star’s greatest fear is a fan. If he ceases to exist, so does he. An actor takes satisfaction in applause but a superstar craves adulation. Early on in the 1990s, when Shah Rukh Khan hit the big league and acquired a formidable fan following, he acknowledged what terrifies every major celebrity but few admit to, in Simi Garewal’s Rendezvous. "Philosophically, I think many times this is not permanent. This is a phase in my life. There’ll be another phase. I could very confidentially say that if this success was taken away, I’d take it very well." "Realistically, I’d be shattered. It’s very nice to be loved by people. Honestly speaking, every little bit of attention that I get, I find it a little less. I want more. I love the fact that people clap when my shoes enter the frame." 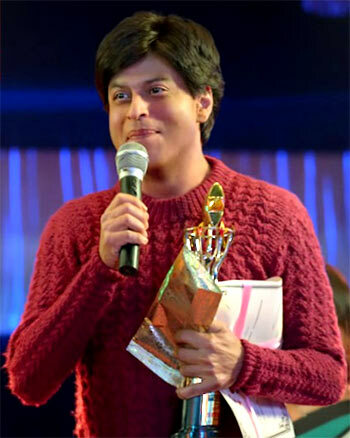 In Maneesh Sharma’s Fan, he plays one such furiously cheering member of the audience as well as confronts his worst nightmare of fading fame and shrinking support to satisfaction. The superstar here is not really SRK (not in the absence of a single cigarette, he can’t be), he’s Aryan Khanna, fictional in the vein of Billu’s Sahir Khan but relies on the original’s accomplishments for authenticity and creating evocative, surreal imagery. On the other hand, his fan, again played by SRK sporting prosthetics that could do with better consistency, has not only imbibed his physicality but also internalised the luminary’s persona just till the point it looks deliberately affected and derived. Solely as a script, Fan is an underwritten, messy construction of unrealistic proportions. But when viewed as a jugalbandi between Shah Rukh Khan and Shah Rukh Khan, the experience is unique and rewarding. Sharma kicks off on a fairly predictable terrain of starry-eyed worship but lends it freshness by way of ambiance. Gaurav Chandna, a middle-class Delhi bloke -- presumably in his mid-30s, Punjabi twang et al, is an ardent Aryan Khanna bhakt running a cyber cafe buried inside a typical DDA market and enjoys the unquestioned support of his parents (a solid Deepika Amin and Yogendra Tiku, easily one of the most credible on-screen papas post - Queen and Neerja). Gaurav is a familiar face in his neighbourhood, a big hit at the local Super Sitara competition, where he mimics his hero to perfection and basks in the deception of momentarily assumed identity. When SRK ‘the fan’ dances against a giant montage of SRK ‘the star’ recreating the iconic moves, it’s a moment that articulates more than words. Exactly why when the fan scrapes off the star’s umpteen photos off his wall and burns them into a glowing pile pledging disturbing consequences, the upshot has desired effect. That’s the beauty of Fan; it’s rich on visual metaphors. What’s flimsy is the motivation for his intense albeit innocent ardour to descend into vicious onslaught. Unlike Hollywood’s The Fan or producer Yash Raj Films’ previous Darr, films it brings to mind, which explained its protagonist’s demented dedication to mental instability, Gaurav is portrayed in an amiable light. I wasn’t convinced about Gaurav’s sudden hostility, his aversion to reason or the ill written cell sequence the events lead to. It could be a telling first encounter between a fan’s setback after he learns the object of his adoration is nothing as he imagined and a star’s realisation of what’s a boon is also a burden. What comes through is an ineffective sparring of antagonised pride and standoffish admonition. At the same it’s nice to see SRK take abundant jabs on the scrupulous superstar front, be it the prevailing insecurity or obsequious behavior towards the moneyed, the whims around his entourage, the irritation at surly foreign officers oblivious to his popularity. When he fiercely demeans his own wax statue at London’s Madam Tussauds, an actor synonymous with arrogance, the irony is not lost. Nor is the artful glance of a waxed Salman’s amused figure witnessing the mockery in the same gallery. It’s a nice touch and yet another proof of Manu Anand’s camerawork working its own parallel narrative. If only the script was as invested at making sense, Fan would truly fly. Instead, the disturbing nonchalance of cops or Gaurav’s international spread and smooth access to movie units and private parties renders it far-fetched. Considering, spoiler alert, Aryan knows of his imposter’s identity and whereabouts from the beginning, it’s ridiculous he’d allow so much damage to his career and image. Sadly, Fan is happier building itself on wobbly grounds to unleash dramatic confusion and high-speed chases in exotic Croatia or dusty Delhi. The prolonged action gets bloody and exhausting towards the end. And so when SRK’s character suggests "Chal khatam kar khel, ho gaya tamasha," to the other SRK character, you see the point. Though designed like a thriller that doesn’t shy from calculated risks, Sharma substitutes the genre’s punch to squeeze in the proverbial silver screen idol’s sanctimonious appeal to his followers. Despite its squandered possibilities, Fan is always engaging. What keeps this Fan going is SRK's star power. The actor treads a delicate space in playing his own biggest supporter but also of the community he represents. He’s careful in his zeal, ensuring real-time fans don’t feel as though he’s mocking their affection just as he’s responsible in his response to such swaying attention.